Iron is one of the most prevalent items used in a household. In fact, if you have a household where there are school going children or a few members working in offices and businesses, an iron is a must. Among the host of options available at your disposal, dry irons are the best you can go with. What is an Iron or Iron Box or Press? Iron is also known as Iron Box and even Press sometimes in the house. It is a device that heats up when connected to electricity, and then you have to press your clothes by moving it on to your clothes. Its heated Soleplate removes wrinkles and gives your clothes a good stretch-free look. The most common type of iron is Dry Iron which is a normal Iron box that you use in your house. There is nothing special. It is said to be Dry iron because it doesn’t have steam functionality like a steam iron. Dry iron is the most common iron type that is being used in Indian houses. In this article, we are going to list 5 best dry iron in India to help you choose the best. It is kind of a buying guide for you that you can use while buying an iron. Moreover, we have a separate article that explains everything that you need to know while buying an iron box. You can read that by clicking here. 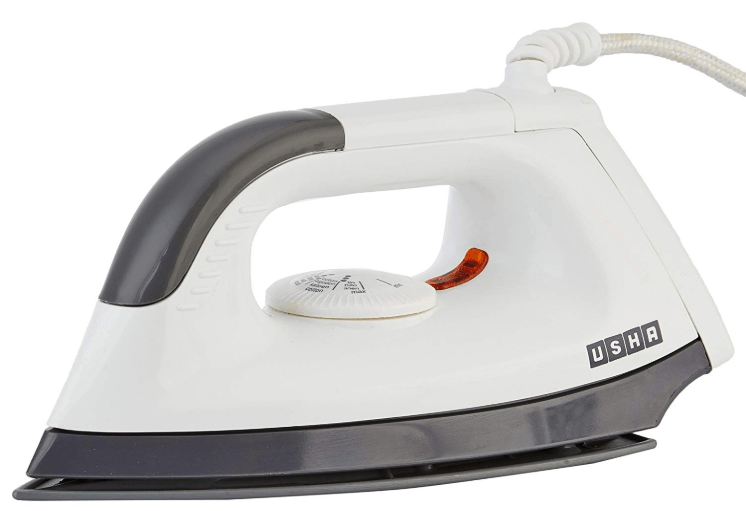 Before we get on to the list of the 5 best dry Iron Boxes, let’s first check out the factors that you should consider while buying a dry iron. 1 What is an Iron or Iron Box or Press? That should be an essential concern if you care about the cleanliness of your clothes. A non-stick option would be the better to consider compared to the stainless steel soleplate. The best iron box should have a scratch proof plate so that the iron will not have issues of dragging. We normally underestimate the importance of the factor, but the cord length should ideally be enough to cover your normal working area. The ideal length for most of the purposes would be around 2 meters or you can have your own requirement for the cord length. A higher wattage would ensure that the iron box will heat up rather quickly instead of forcing you to wait for longer. The best options for wattage in the best iron box should be between 1200 and 1700 Watts. Pay attention to the budget as the irons with high wattage come with a heavy price tag as well as they use more electricity. So do consider as per your need. Weight is yet another important aspect to consider while buying a dry iron. A heavyweight iron box will provide better ironing functionality than a light weighted one. Tighter clothes like jeans would need heavyweight Of course, lightweight can be easy to move on, but may not give you the best ironing. We would consider a weight of around 3 pounds to be ideal enough. Moreover, it is all up to your personal requirement. So, consider the weight as well. Most of the irons offer you a warranty of around of one year. However, you may find a few options with two years of warranty. That would be a good option if you want to be sure of durability, but please note that the warranty alone may not stand proof to the usefulness of a dry iron. We kept Warranty in the list because it saves your money if your iron box stops working within the guarantee period. It will be repaired free of cost. Having understood what you should look for in the best dry iron in India, let us now move ahead to check out a few good options to make your shopping easier. We hope to help you find the best dry iron box in India for your needs. There is no doubt that USHA is India’s leading brand in producing home appliances, and that is what you get in USA UI 1602 Dry Iron. The iron box is one of the best in this price range. It is only 0.79 KGs in Weight. Knob for variable heat settings is available that you can use to set temperature as per the fabric you are going to iron. It is of 1000-watts power which allows it to get heated in no time, and offer smooth ironing experience. Non-stick PTFE coated Sole Plate makes sure your fabric is safe from getting stuck with sole plate. Lightweight yet powerful with 1000-watt power. Easily portable due to its small size and weight. Enough cord length which is around 2 meter. We didn’t find any cons in the product but a few customers complain about the indicator is not working, and the sole plate is sticking. But, most of the customers didn’t find such issues. Q: Does this Iron good for cotton clothes and Jeans? A: Yes, this is good for both but, to be honest; any lightweight dry iron may not be efficient for removing stubborn wrinkles. A: As per the temperature setting you have set, it gets heated up quickly due to its 1000-watt power. 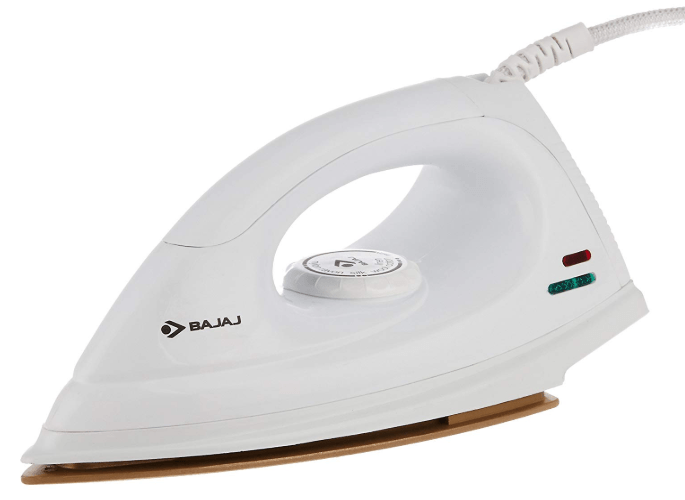 Bajaj DX 7 1000-Watt Dry Iron is yet another lightweight option for your needs in best ironing experience at an affordable price. The 1000 watt dry iron works in tune with even the Bajaj heavyweight iron box options you may have checked out. Non-stick coated soleplate provides you protection against overheating and torn clothes. The 360-degree swivel cord would ensure free and easy movement without getting tangled or pulled. The cord measures 70 inches. The dual indicator would ensure a better safety as when soleplate is heated, the red light glows, and when the desired temperature is reached, the green light glows. It also comes with a thermal safety fuse to take care of any issues of thermal overloading. The 1000 watt power would ensure it heats up in a few seconds. Suitable for all sorts of clothes as it quickly removes wrinkles from all fabric. Cord length is good enough for most of the purposes. May not suit clothe types like jeans, because of its light-weight. Q: What is the warranty available? A: Two years warranty is available. 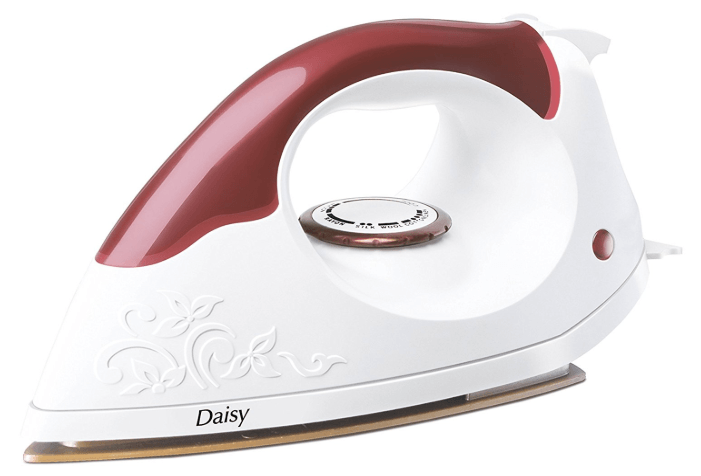 The Morphy Richards Daisy 1000-Watt Dry Iron indeed offers you an aesthetically pleasing look in addition to the high-end functionalities you would be looking for in your dry iron. One of the dry iron under 500 as per the current availability, it provides with access to a swivel cord. The soleplate comes with the American heritage Teflon and ensures a trouble-free service. 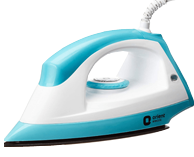 The non-stick nature of the sole plate helps the dry iron provide a smoother glide over any type of clothes. The easy to use temperature control ensures the best experience depending upon your fabric. The lightweight functionality with the plastic body will make the ironing process less laborious. And then, there is a neon indicator for showing you the status of heating. This dry iron heats up real faster. It comes with a good grip for easy handling. Has a plastic body that makes it shockproof as well as light. The floral design looks great, but it fades after a while. Q: Does it have an Automatic on/off feature? A: Yes, it does have an automatic on/off as per the heating requirements. 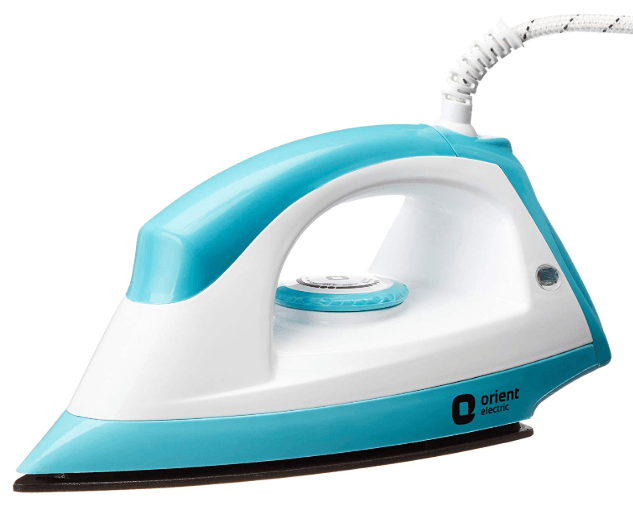 The Orient Electric Fabrijoy DIFJ10BP 1000-Watt Dry Iron is available in a color combination of white and blue. Yet another option for the dry iron under 500, it offers you an easy to handle grip. The sole plate is non-stick and ensures a smoother gliding of the iron on the clothes. The thermostat comes with silver layered contacts thus ensuring a longer life. The 360-degree swivel cord would be helpful in uniform ironing efficiency. The soleplate made from American heritage material would ensure uniform performance. The design speaks a lot about aesthetics. May take a little more time to cool off. A: You get two years warranty. Q – How much time will it take to heat up? A: Around to three minutes. 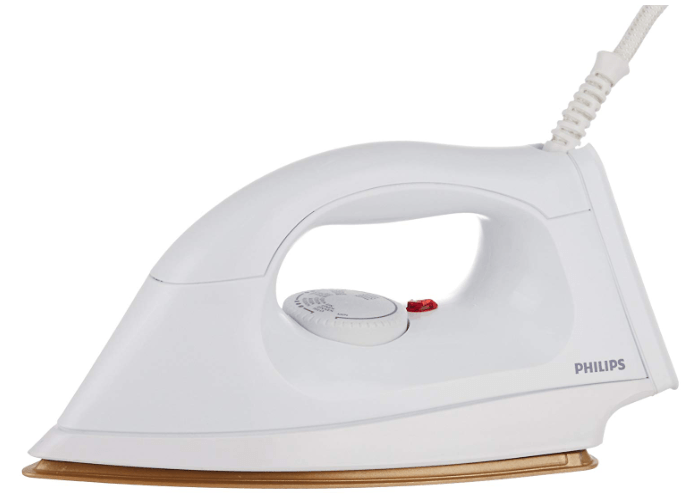 The Philips HI114 1000-Watt Golden American Heritage Soleplate Dry Iron is one of those efficient dry iron boxes that can give a heavyweight iron box a run for their money. Equipped with the Golden American Heritage Soleplate, it offers you a durable and elegant functionality. The 360-degree swivel cord arrangement should help you achieve the best results in reaching the stubborn places you would not reach that easily. The cord is completely flexible and not vulnerable to damages under ideal conditions. The Philips HI114 dry iron with its ergonomic design helps you work with the iron without straining your arms. We would definitely treat it as the best among the dry iron box under 1000 options available. Best in class button groove improves the performance. Q: Auto cut off feature available? A: Yes, it does offer you an auto cut off feature. We assume the above choices should help you choose the best iron box that meets your exact demands. However, please note that we have focussed on the lightweight dry irons while compiling this list. We think the products featured here should provide you with an efficient service compared to the heavyweight iron box options available. Moreover, we have included options for the dry iron box under 1000 as we thought that would be what an average Indian customer would be willing to pay.